Here at Shakerock Farm, we painstakingly handcraft all natural goat milk soaps and other fine farm-fresh natural products. What began as a fun way to teach our children how to work hard and make use of the land that God has given us has blossomed into a thriving cottage industry. Mom, Dad, and all nine of the Green children take part in our business - from raising to hand-milking our registered goats - to handcrafting our soaps in small, carefully controlled batches - to research and chemistry. 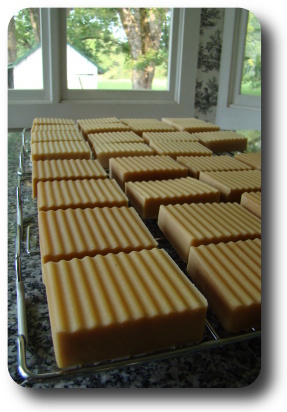 True soap is made from oils, lye, and liquid, through a complex chemical process called saponification. Although grocery store "soap" begins this way too, the expensive, moisturizing glycerin produced is removed and sold to cosmetics manufacturers. We start with farm-fresh goat milk instead of water. Full of natural emollients that leave your skin feeling silky soft, goat milk has been prized for centuries for its moisturizing properties. We add costly, imported vegetable oils and butters with no preservatives, then open-air cure the soap for at least four weeks. The result is something that is rare today - pure, natural, moisturizing - handmade farm-fresh goodness - from our house to yours. We know you'll love Shakerock Farm Goat Milk Soap! A full line of luxurious lotions, cremes, lotion sticks, and hydrating face and eye cremes. Soap Dishes, Shaving Kits, and other great gifts! Thanks for all the prayers and concern for our precious little baby Julieann. Click Here for the latest news.